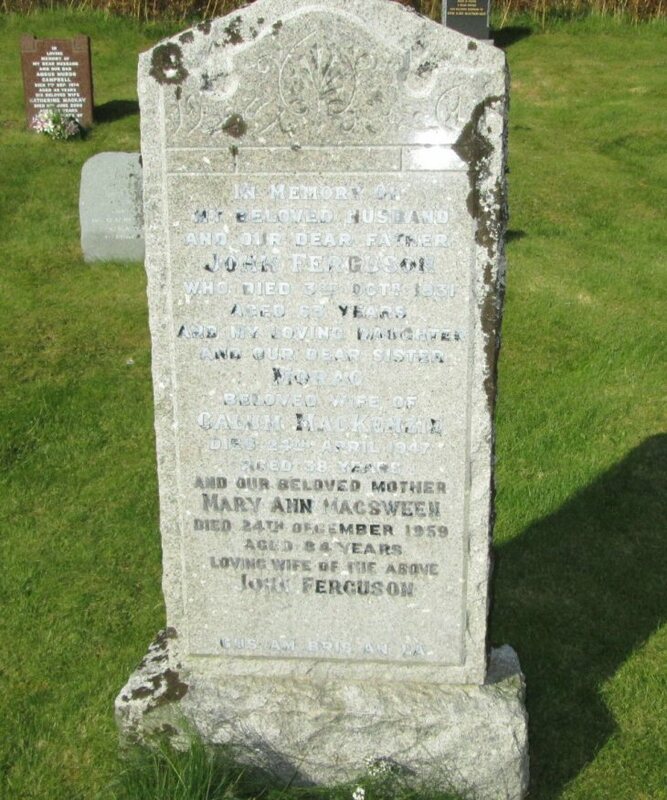 Skye Gravestones | John & Mary (Macsween) Ferguson & family. John & Mary (Macsween) Ferguson & family. In memory of/my beloved husband/and our dear father/JOHN FERGUSON/who died 3rd Octr. 1931/aged 63 years/and my loving daughter/and our dear sister/MORAG/beloved wife of/CALUM MacKENZIE/died 24th April 1947/aged 38 years/and our beloved mother/MARY ANN MACSWEEN/died 24th December 1959/aged 84 years/loving wife of/JOHN FERGUSON. Gus am bris an là." Picture Added on 12 January 2014.